Nine fifteen foot wands light up the path to St Paul'severy night at 6.45pm from 18th October to 12th November to celebrate the release of the latest Harry Potter film, Fantastic Beasts: The Crimes of Grindelwald. 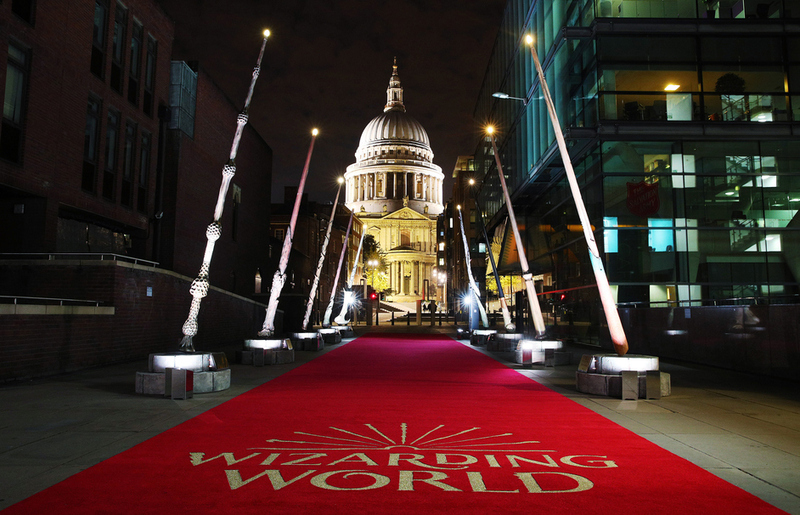 As well as the Fantastic Beasts: Wizarding World Wands installation they're running special events including a spooky one on Wednesday 31st October for Halloween when you can learn all about the Dark Arts. What are the best dining options near Fantastic Beasts: Wizarding World Wands London? Fantastic Beasts: Wizarding World Wands gyms, sporting activities, health & beauty and fitness. The best pubs near London Fantastic Beasts: Wizarding World Wands. Fantastic Beasts: Wizarding World Wands clubs, bars, cabaret nights, casinos and interesting nightlife. Where to have your meeting, conference, exhibition, private dining or training course near Fantastic Beasts: Wizarding World Wands. From cheap budget places to stay to luxury 5 star hotels see our special offers for Square Between Millennium Bridge and St Pauls Cathedral hotels, including Crowne Plaza London The City from 77% off.